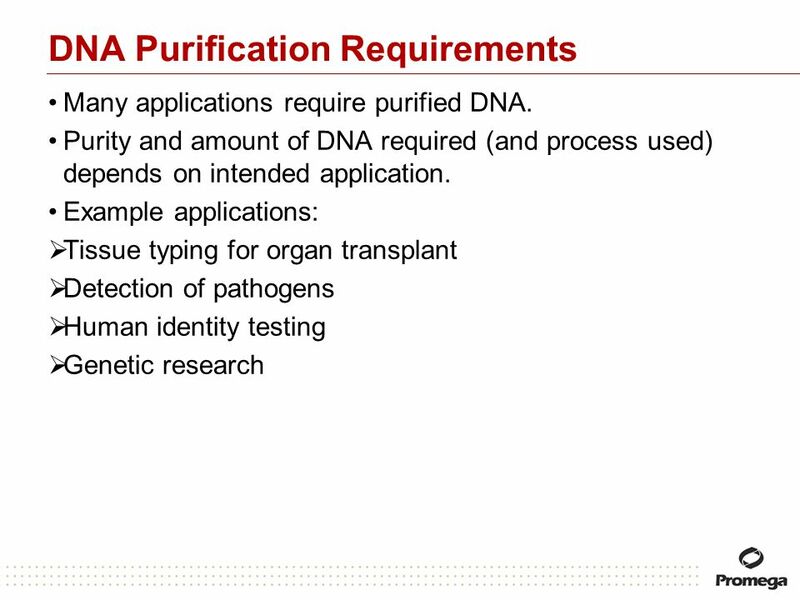 Many applications require purified DNA. Purity and amount of DNA required (and process used) depends on intended application. Example applications: Tissue typing for organ transplant Detection of pathogens Human identity testing Genetic research Purified DNA is an essential requirement for molecular biology, molecular diagnostic and research applications. Different applications have different requirements for purity. For example, contaminants in purified DNA can inhibit the polymerase chain reaction or inhibit cutting of DNA by restriction enzymes. 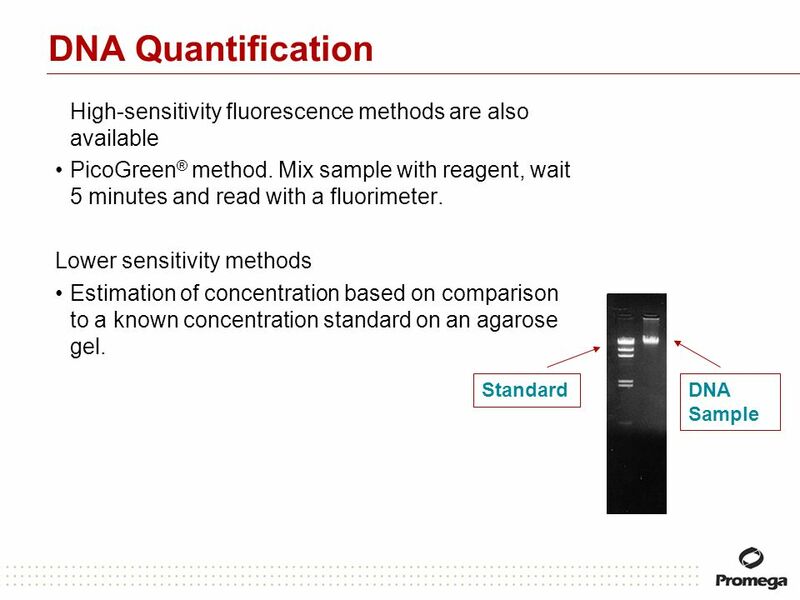 Although PCR can be performed on crude extracts, sensitive assays such as quantitative PCR and most diagnostic applications require a high degree of purity. 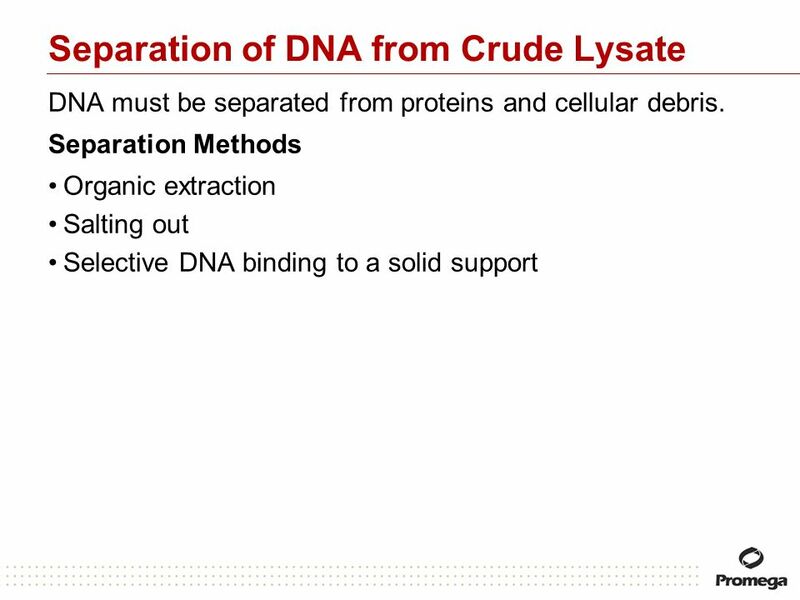 Separating DNA from other cellular components such as proteins, lipids, RNA, etc. Avoiding fragmentation of the long DNA molecules by mechanical shearing or the action of endogenous nucleases. Effectively inactivating endogenous nucleases (DNase enzymes) and preventing them from digesting the genomic DNA is a key early step in the purification process. DNases can usually be inactivated by use of heat or chelating agents. 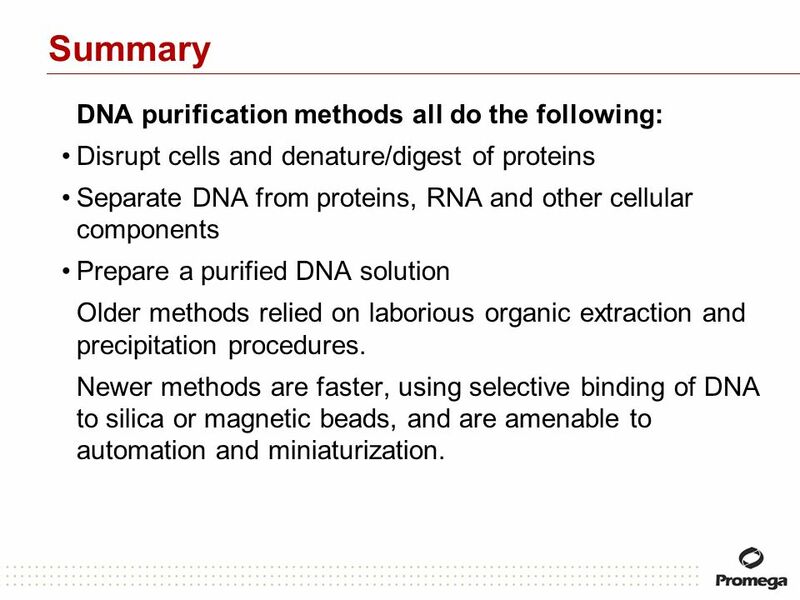 Challenges in DNA purification include: 1. Separation of DNA from the rest of the cellular components. 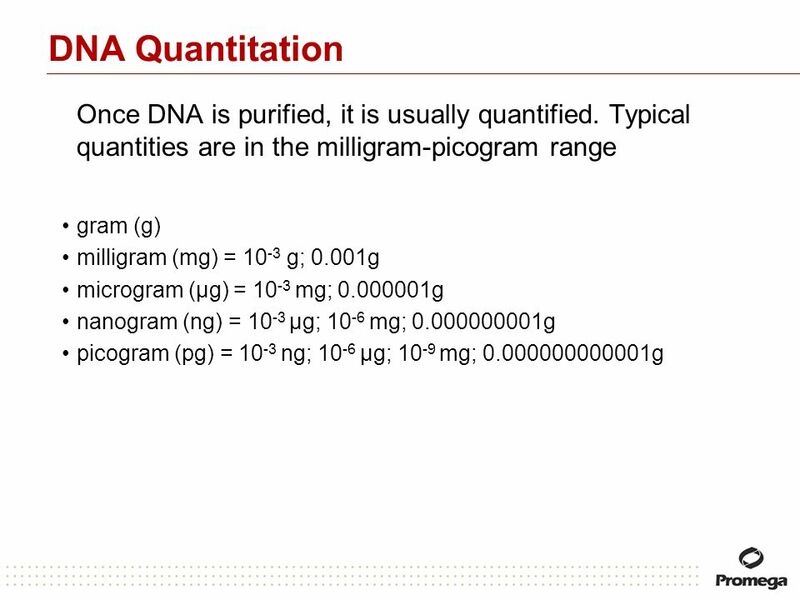 Ideally, the final DNA preparation should be as pure as possible. 2. Preservation of DNA molecules during the purification process. Inactivation of nucleases is key to successful DNA purification. Endogenous DNase enzymes will quickly degrade DNA and must be inactivated effectively. 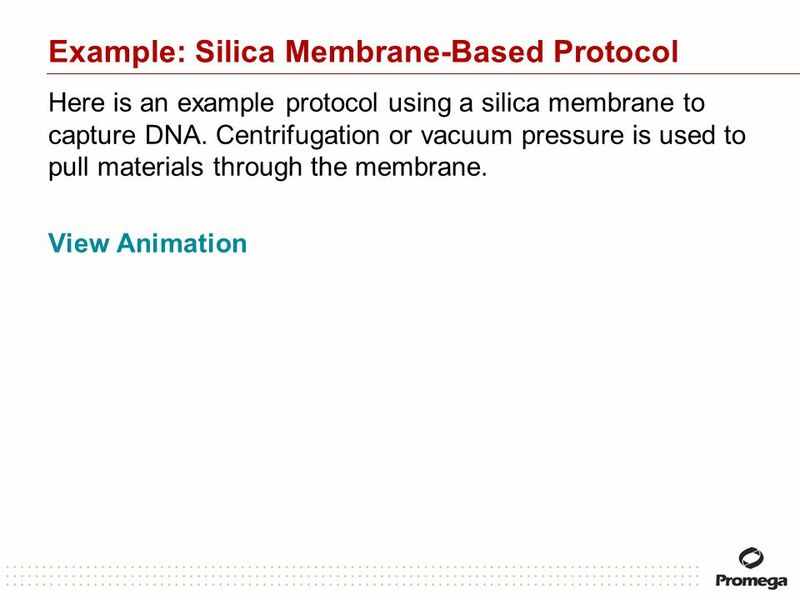 Most DNA purification methods use chelating agents or heat to inactivate endogenous nucleases. Chelating agents sequester magnesium ions, which are essential for nuclease function. Heat denatures proteins, and therefore inactivates nuclease function. 4 Quality is Important Best yields are obtained from fresh or frozen materials. Blood/Tissues must be processed correctly to minimize destruction of DNA by endogenous nucleases. DNA yield will be reduced if endogenous nucleases are active. 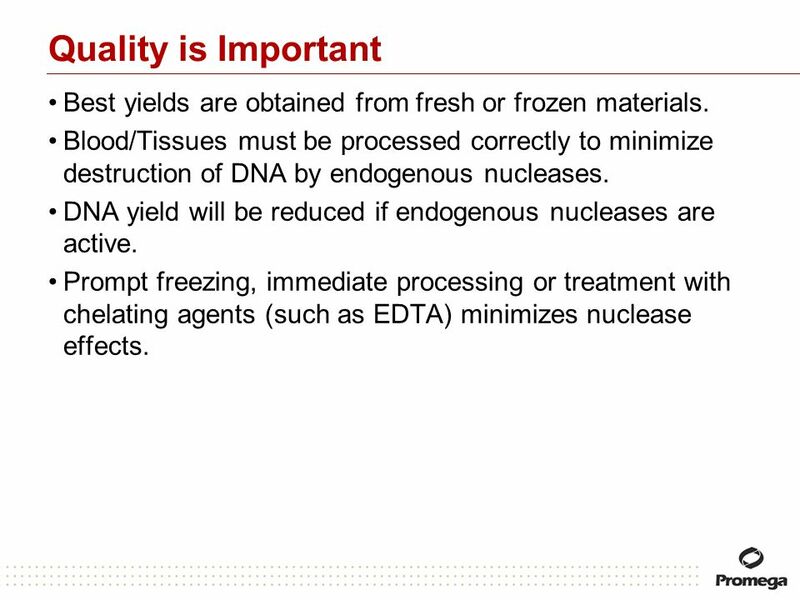 Prompt freezing, immediate processing or treatment with chelating agents (such as EDTA) minimizes nuclease effects. It is important to process starting materials quickly to minimize DNA degradation by endogenous nuclease activity. If blood or tissues are not processed promptly they should be frozen until use. Some tissues require preprocessing such as mechanical grinding prior to use. Tissue can be ground up and frozen prior to processing. 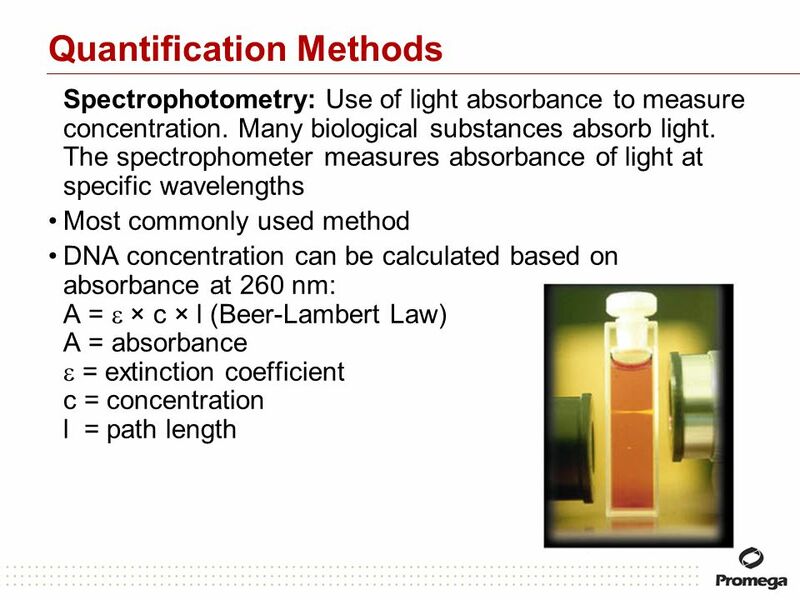 There are many DNA purification methods. 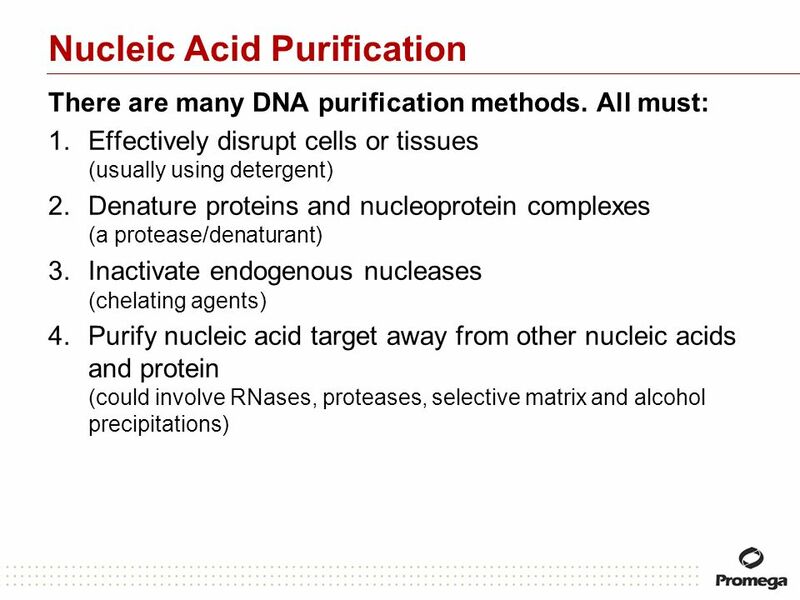 All must: Effectively disrupt cells or tissues (usually using detergent) Denature proteins and nucleoprotein complexes (a protease/denaturant) Inactivate endogenous nucleases (chelating agents) Purify nucleic acid target away from other nucleic acids and protein (could involve RNases, proteases, selective matrix and alcohol precipitations) All DNA purification methods accomplish the steps listed here but use different methods to perform each step. The cells and nuclei must be lysed to release DNA, proteins must be denatured and nucleases inactivated. Finally, the DNA must be effectively separated from the other cellular components. 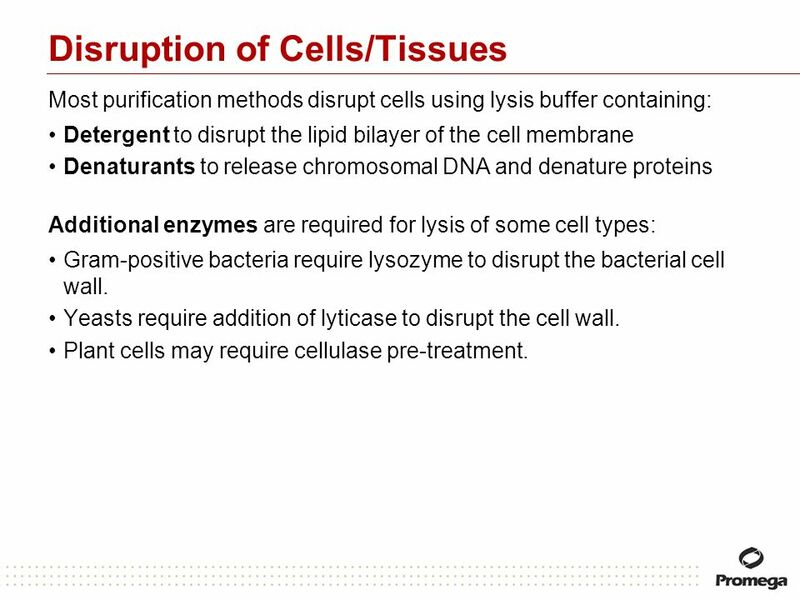 Most purification methods disrupt cells using lysis buffer containing: Detergent to disrupt the lipid bilayer of the cell membrane Denaturants to release chromosomal DNA and denature proteins Additional enzymes are required for lysis of some cell types: Gram-positive bacteria require lysozyme to disrupt the bacterial cell wall. Yeasts require addition of lyticase to disrupt the cell wall. Plant cells may require cellulase pre-treatment. 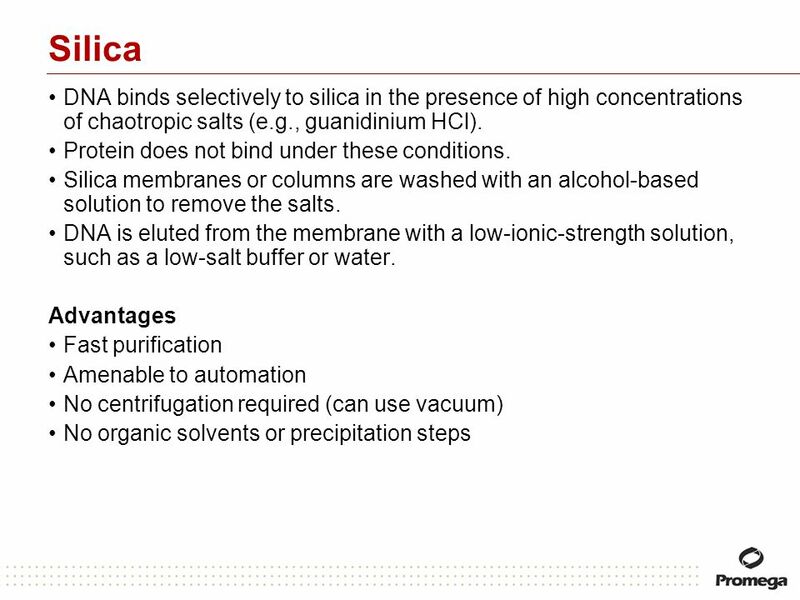 Most mammalian cells and cultured cells can be lysed easily using detergents. Organisms that have cell walls in addition to a cell membrane usually require treatment with additional enzymes to effectively disrupt the cell wall. For example, lysozyme is used to digest the thick peptidoglycan cell wall of Gram-positive bacteria and Lyticase (or zymolase) enzyme is used to disrupt the polysaccharide cell wall of yeasts. For some plant species, mechanical disruption of tissues in addition to detergent treatment is sufficient. For other plant species, use of cellulase enzyme is required to disrupt the cell wall structure and maximize DNA yield. 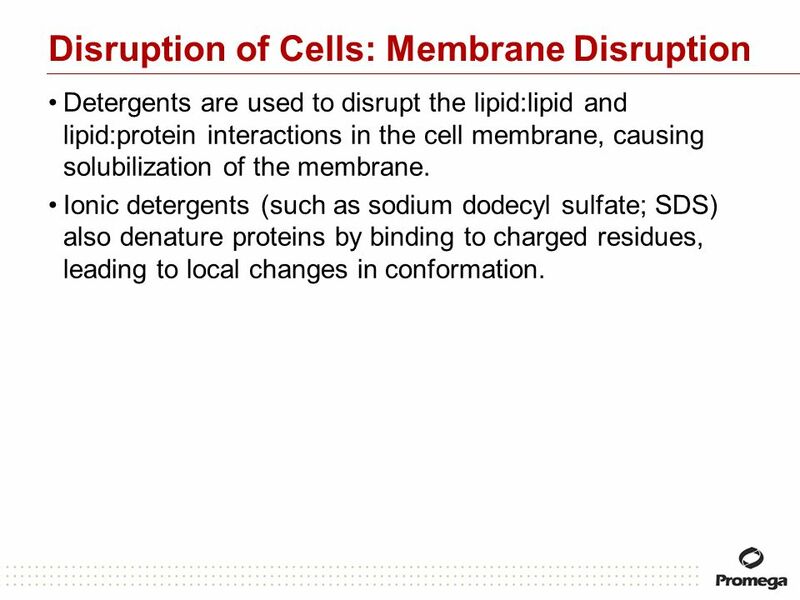 Detergents are used to disrupt the lipid:lipid and lipid:protein interactions in the cell membrane, causing solubilization of the membrane. Ionic detergents (such as sodium dodecyl sulfate; SDS) also denature proteins by binding to charged residues, leading to local changes in conformation. When the lipid membrane is disrupted by the action of detergent, the contents of the cell are released. Ionic detergents can denature proteins by binding to charged side chains, causing local changes in protein conformation and consequent loss of function. 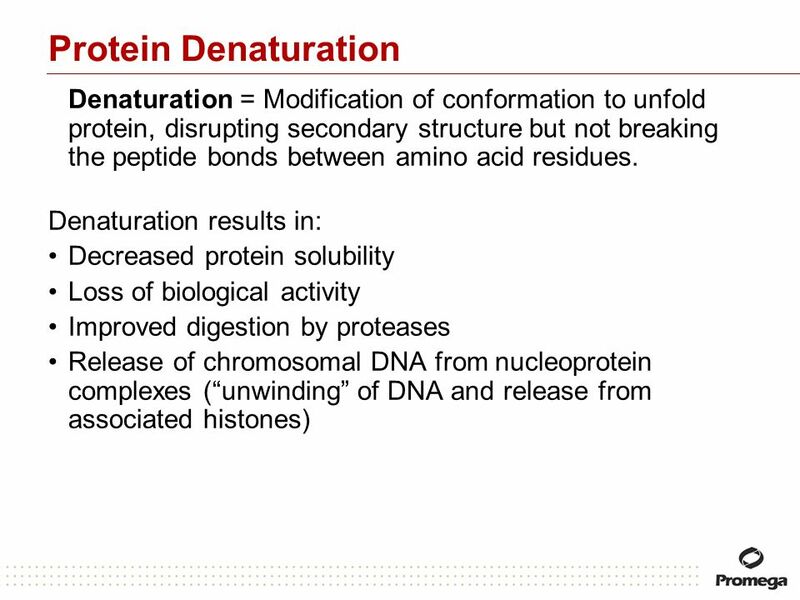 8 Protein Denaturation Denaturation = Modification of conformation to unfold protein, disrupting secondary structure but not breaking the peptide bonds between amino acid residues. Denaturation results in: Decreased protein solubility Loss of biological activity Improved digestion by proteases Release of chromosomal DNA from nucleoprotein complexes (“unwinding” of DNA and release from associated histones) In the mammalian cell, DNA is typically present in a nucleoprotein complex (chromatin), where the DNA is wound around proteins called histones. This supercoiling of DNA allows the 1.8m of genomic DNA in a human cell to fit into the nucleus. More about chromatin structure is available in Alberts et al, Molecular Biology of the Cell, Garland Publishing, 1994, pages 342–46. 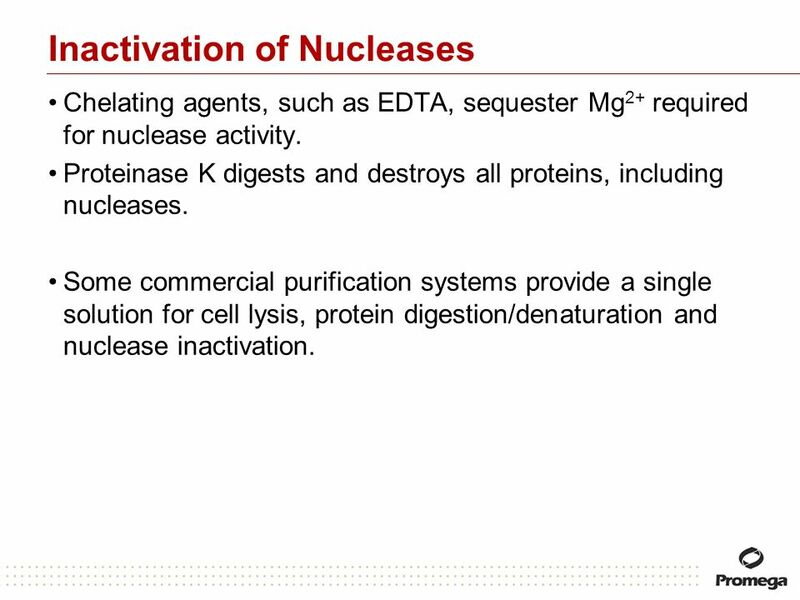 Chelating agents, such as EDTA, sequester Mg2+ required for nuclease activity. 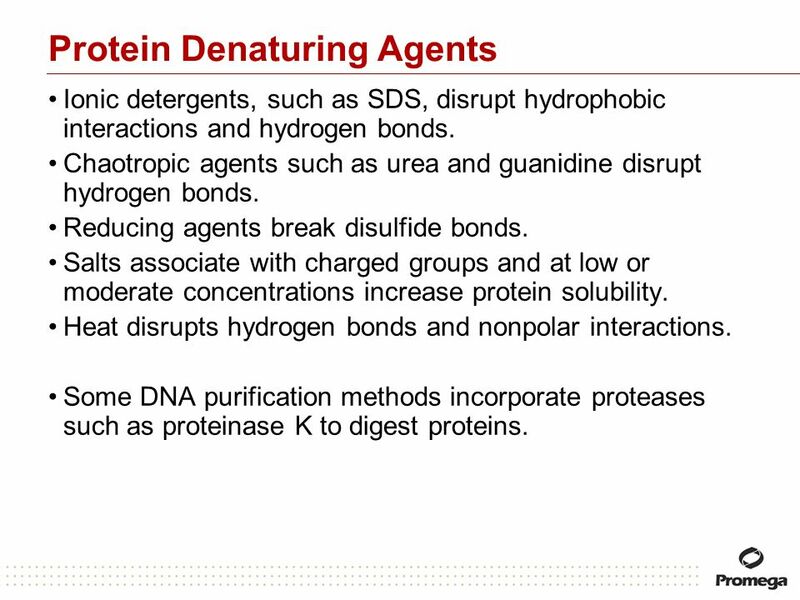 Proteinase K digests and destroys all proteins, including nucleases. 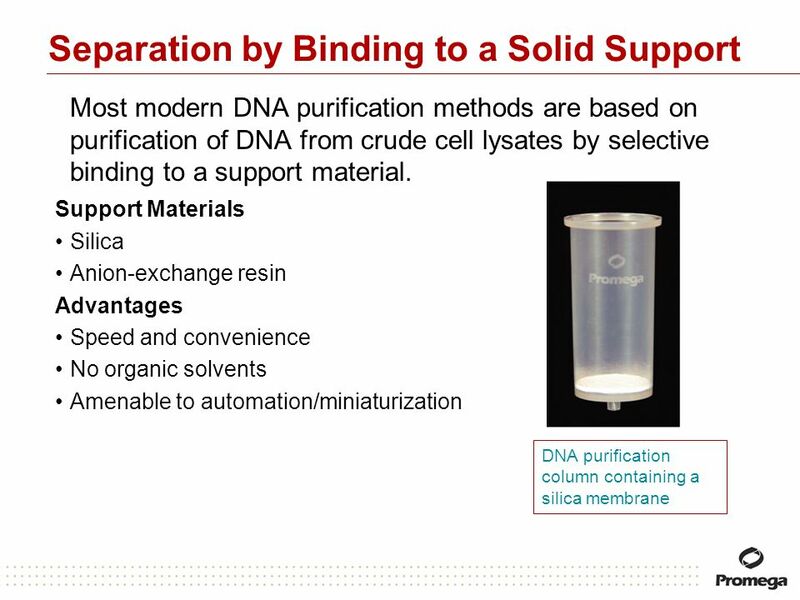 Some commercial purification systems provide a single solution for cell lysis, protein digestion/denaturation and nuclease inactivation. 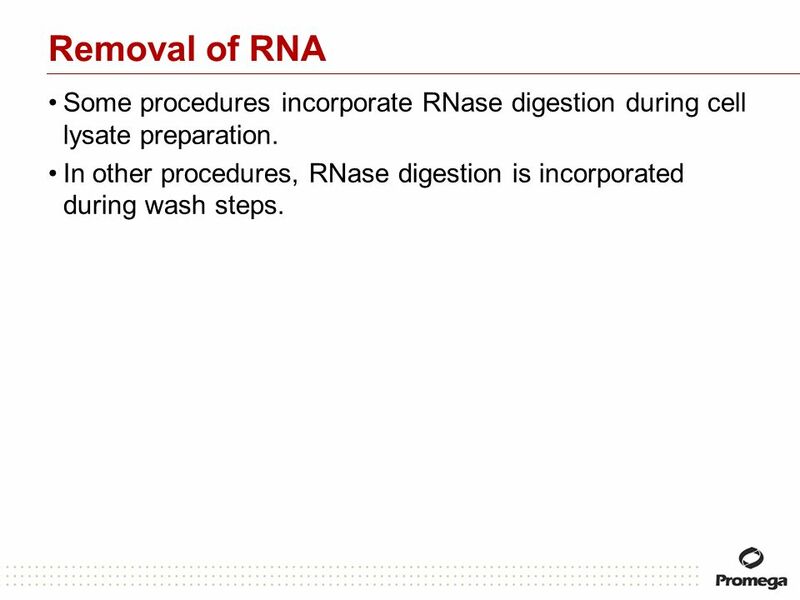 11 Removal of RNA Some procedures incorporate RNase digestion during cell lysate preparation. In other procedures, RNase digestion is incorporated during wash steps. 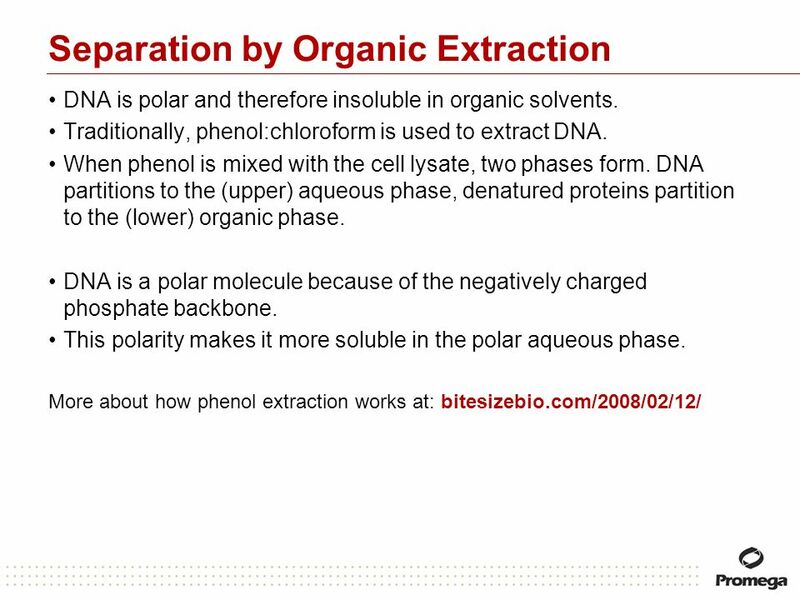 Methods using organic extraction or salting-out techniques result in an aqueous solution containing DNA. The DNA is precipitated out of this solution using salt and isopropanol or ethanol. 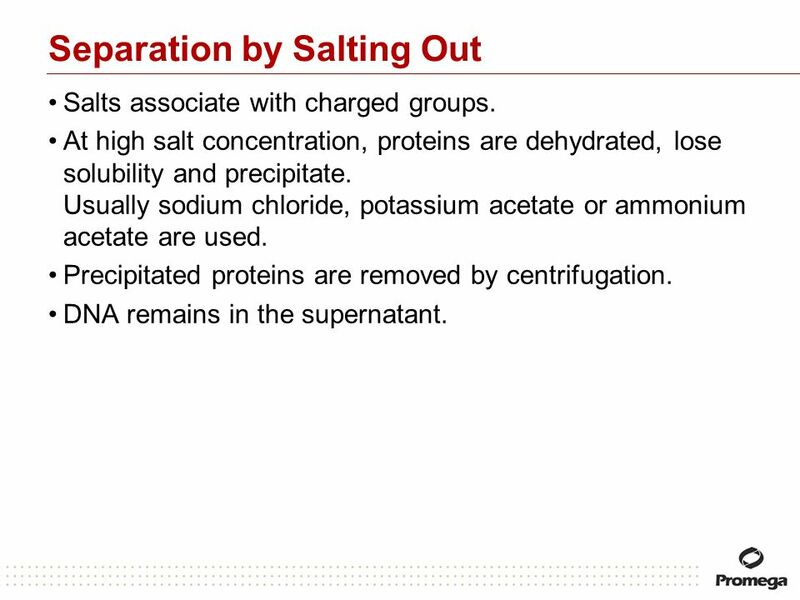 Salt neutralizes the charges on the phosphate groups in the DNA backbone. 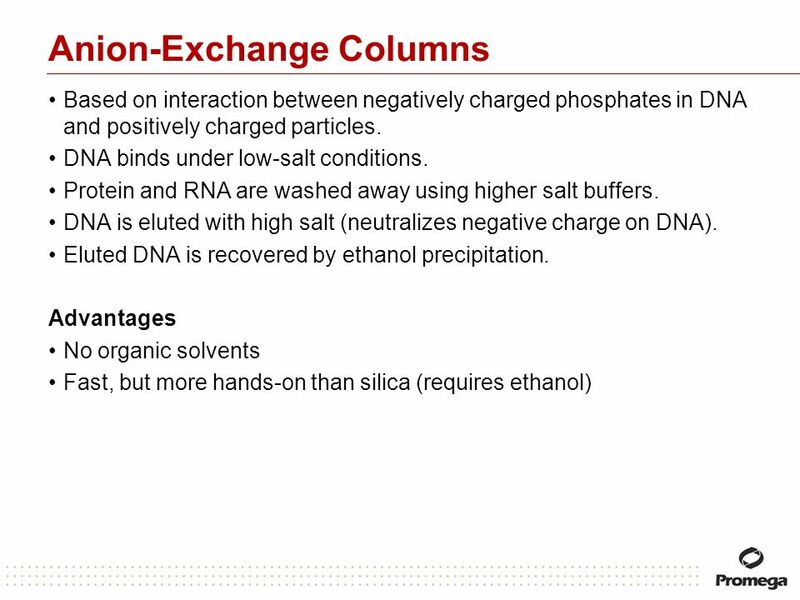 The alcohol (having a lower dielectric constant than water) allows the sodium ions from the salt to interact with the negatively charged phosphate groups closely enough to neutralize them and let the DNA fall out of solution. Nucleic acids are hydrophilic due to the negatively charged phosphate groups in the phosphate-sugar backbone of the molecule. The positively charged sodium or ammonium ions in the salt neutralize the negatively charged phosphate groups on the DNA backbone. 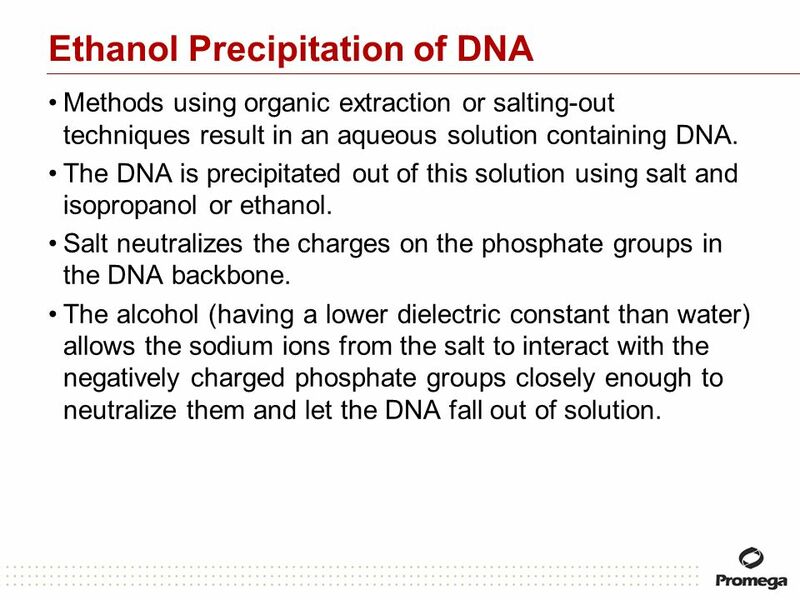 In the presence of alcohol, the positively charged ion is brought into close enough proximity to the phosphate groups to neutralize the charge and cause the DNA molecule to become less polar (more hydrophobic) and come out of solution. Disrupt cells and denature/digest of proteins Separate DNA from proteins, RNA and other cellular components Prepare a purified DNA solution Older methods relied on laborious organic extraction and precipitation procedures. 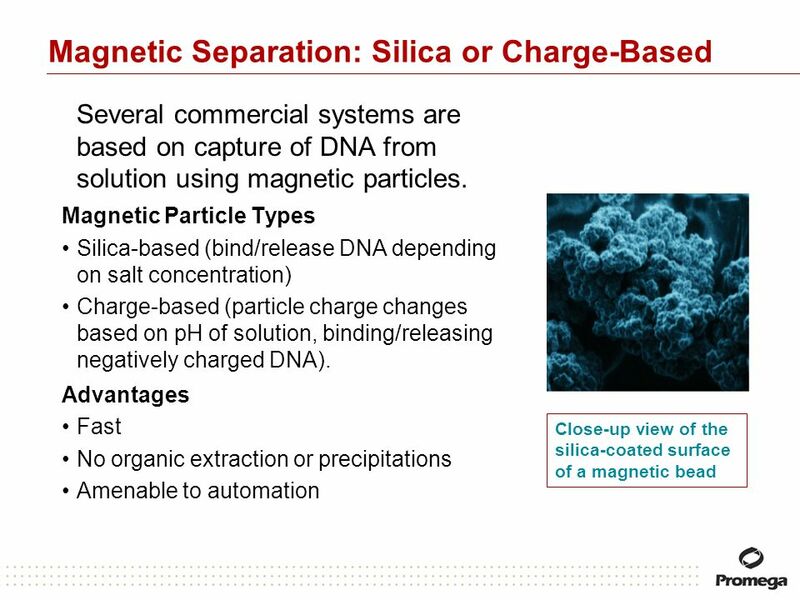 Newer methods are faster, using selective binding of DNA to silica or magnetic beads, and are amenable to automation and miniaturization. 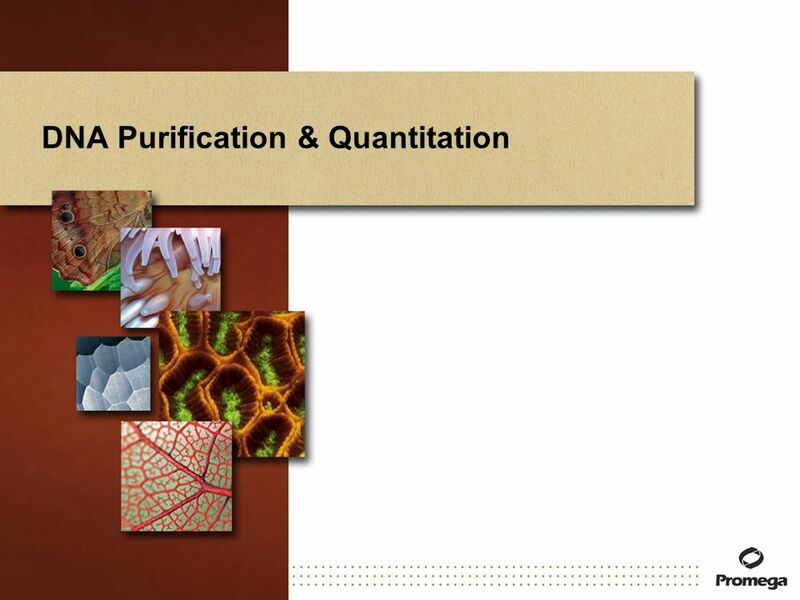 Download ppt "DNA Purification & Quantitation"
Analysis of gene expression by real-time PCR RNA Isolation from tomato. Organic Extraction Presented by: Robert O'Brien Training Specialist – Forensic Biology. Chp 3 Purification of DNA from Living Cells Huseyin Tombuloglu PhD. GBE310, Spring 2015. Bio 98 - Lecture 4 Amino acids, proteins & purification. 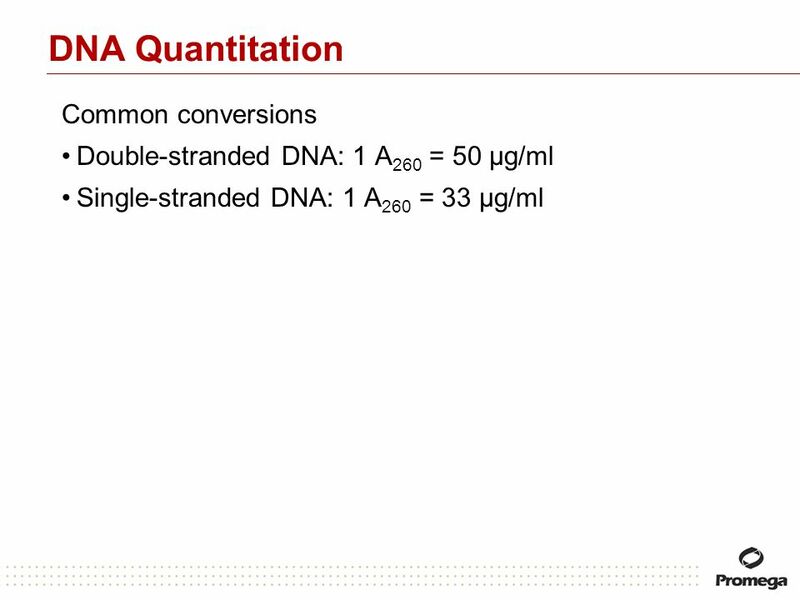 Isolation and Quantification of Nucleic Acids Catherine Unabia, Ph.D. June 12, 2007 Advances in Bioscience Education Leeward Community College. Analysis of Gene Expression by Real Time RT PCR. Broad and Long Term Objective To characterize the expression of ribulose 1-5 bisphosphate carboxylase. Isolation of Genomic DNA from Arabidopsis thaliana. 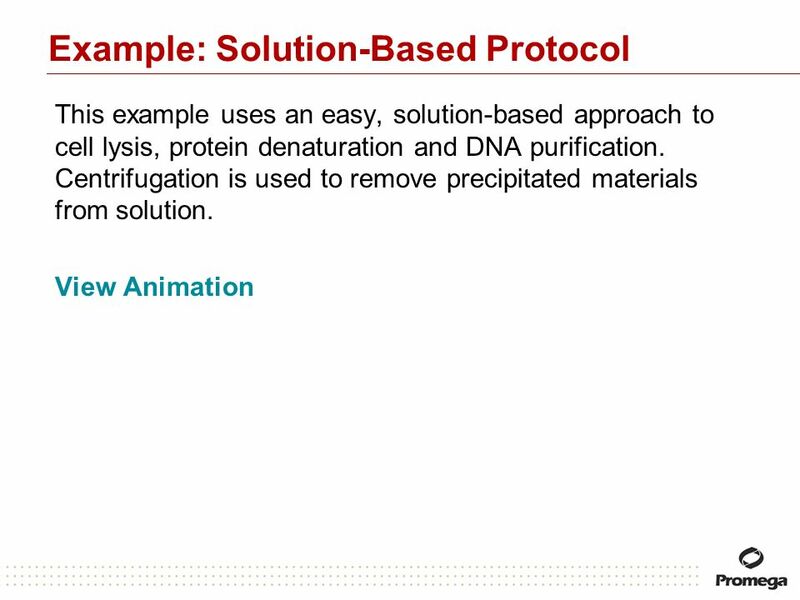 Isolation of Nucleic Acids Goals: removal of proteins DNA vs RNA isolation of a specific type of DNA (or RNA) Types of Methods: differential solubility. MYB61 Single or Multicopy gene in Arabidopsis Thaliana? Isolation of Plasmid DNA June 21, 2007 Leeward Community College. Quiz 1.Bacteria of which phase are used for most experiments? Why? Which phase today? 2. What are the three properties that a plasmid has to have to be.